79 year old female with a history of bladder cancer in her 3rd week of chemotherapy, atrial fibrillation, and hypertension, presented with altered mental status, diarrhea, generalized weakness. CT abdomen and pelvis from outside hospital revealed diverticulitis and labs revealed severe neutropenia and elevated lactate. Vitals in the ED showed fever, tachycardia, and hypotension with SBP in the 70s. The patient was started on levophed. Blood pressure cuff readings were not accurate therefore it was deemed necessary for arterial line placement. During previous ultrasound-guided arterial line placements, I had used the transverse approach. 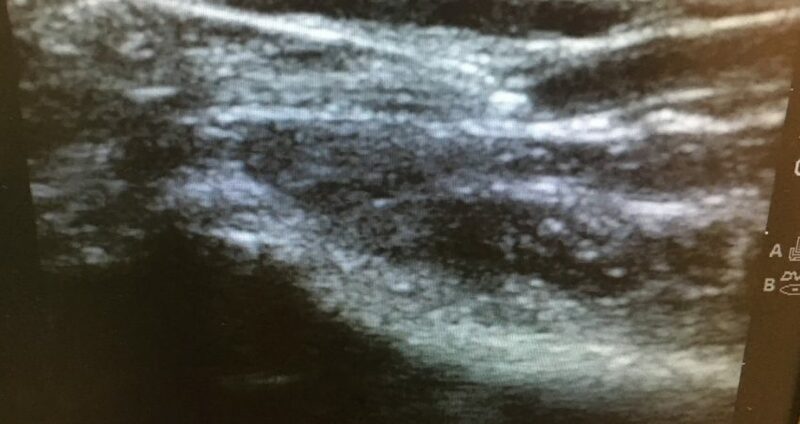 For this line I used the longitudinal ultrasound-guided approach as shown in the image below. Using this approach, successful access was gained after one attempt. The patient was admitted to the MICU. Overnight she was intubated and maxed on 4 pressors. Her family decided this was not the kind of life the patient would have wanted. She was extubated and placed on a dilaudid drip until she passed away later that afternoon. A randomized controlled crossover trial has been done on catheterized line placement in the transverse versus longitudinal axis of the ultrasound probe. A group of 57 EM residents and attendings were assessed in detection and cannulation of the axillary vein of a torso of a phantom model using transverse and longitudinal orientations of the ultrasound probe. They were measured on time to successful cannulation, number of skin punctures, number of needle redirections, and number of complications. The results showed that the longitudinal method was superior in successful placement on the first try, less redirections of the needle, and less time to IV access as compared to the transverse method.